Cox Powertrain will preview its professional outboard motor, the CXO300, at the Workboat Show in New Orleans later this year. 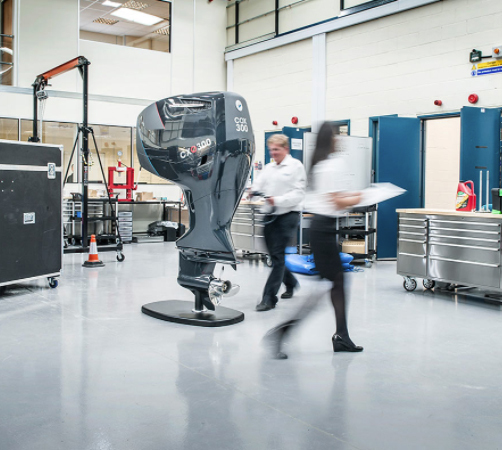 Britain’s Cox brought together engineers from Formula 1 racing and automotive engine design to develop this new concept diesel engine, providing gasoline outboard performance, with diesel economy and reliability. Cox will display a full-sized model of the CXO300, which is a revolutionary opposed-piston, diesel outboard designed specifically for professional marine users. Delivering 300hp and weighing only 300kg, it is designed for commercial, government and military applications, where performance, durability, and fuel efficiency are paramount. Cox is a British company based in West Sussex, dedicated to answering the demands of commercial and government marine operators, for a reliable and powerful diesel outboard. With petrol now not permitted on board many commercial vessels and superyachts, the development of a viable diesel outboard for RIBs and tenders, offering the comparable power and weight of a gasoline engine, has been an important factor in the rapid expansion of Cox Powertrain.